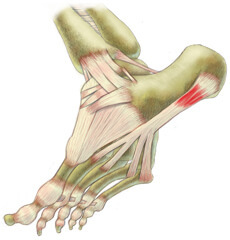 Plantar Fasciitis is caused by excessive stretching and overloading of the Plantar Fascia. The Plantar Fascia does not stretch - Your plantar is not supposed to stretch. Stretching can actually damage it further and make your situation worse. You want to speed up the healing process, not reverse it. You want to promote blood flow to help your Plantar heal quickly. Don't keep damaging it - Rest your Plantar. 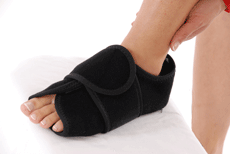 Relieve the pain and swelling with a ColdCure® Foot Wrap. Speed up the healing process by stimulating blood flow with a BFST® Foot Wrap. Start with the ColdCure® Foot Wrap to alleviate the pain and inflammation in your foot. Do regular ColdCure® treatments until your swelling and inflammation have subsided, then start doing BFST® treatments. The BFST® Foot Wrap will work to actively heal your damaged tissue through the promotion of blood flow. It targets the injured area of your foot, deep below the skin, creating an ideal environment for healing. This is the technology you need to get rid of your Plantar Fasciitis and get back to your active lifestyle. Plantar Fasciitis is a prime example of a condition that involves chronic re-injury. This re-injury takes place whenever you put a large load on the foot or attempt to stretch the fragile tissue in the newly healed Plantar. Devices and exercises to stretch the Plantar will make your condition worse. Even though stretching may relieve the pain and you may feel like it helps, you are actually reversing the healing process by tearing the Plantar further. Wear a ColdCure® Wrap as much as possible to relieve your pain and swelling and protect your foot from further damage. Avoid re-straining your injury as much as possible. Giving your foot a rest is hard, but it is very important in the early stages of healing your Plantar Fasciitis. Do this and your Plantar Fasciitis can truly heal - finally. When you entered our site, a Plantar ColdCure® and Plantar BFST® medical device were automatically put into your shopping cart. What's in your cart now are the two things you need to stop the pain and speed the healing of your Plantar Fasciitis. This special cart also includes Free Express Shipping - you will have your product in just 1 or 2 days. Most people find King Brand is the best online experience ever. Our products are simply the best treatment for Plantar Fasciitis. Delivery is fast. Our staff are incredibly knowledgeable and helpful. We do everything we can to help you. The purchase of every BFST® and ColdCure® Wrap comes with the free professional consulting services of our King Brand® Advisors. This added benefit is extremely valuable in terms of your treatments and overall recovery. One of our Advisors will contact you 4 or 5 days after your order has been delivered to see how your treatments are going and answer any questions you may have. Our Advisors are thoroughly trained on Plantar Fasciitis and can help you create a treatment plan that is specific to your needs. They are also highly knowledgeable when it comes to BFST® and ColdCure® technology and treatments. Our Advisors spend all day every day helping people like you through every stage of their recovery. 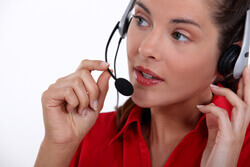 They are truly dedicated to helping you heal and feel better as quickly as possible. While one of our Advisors will follow up with you directly, you are welcome to contact us any time if you need any treatment advice or guidance. We're here to help you every step of the way. If you want to heal your Plantar Fasciitis, you need to rest your foot and stimulate blood flow. For Plantar Fasciitis, blood flow is the most critical element in rapid recovery. Unfortunately, an injured foot at rest has very limited blood flow. That's why we developed Blood Flow Stimulation Therapy (BFST®). BFST® Wraps are designed to promote blood flow while you're at rest. While physical activity stimulates blood flow, it can also make your injury worse. The BFST® Wrap brings nutrient-rich, oxygenated blood flow to your injury while you're at rest. This means you can rest your foot and avoid re-injury while your Plantar receives the additional blood flow it needs to heal. 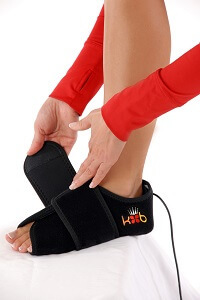 The BFST® Foot Wrap works to actively stimulate blood flow through the bottom of your foot. This is very important because when your foot is at rest, blood flow to the injured area is severely impaired, stalling the healing process. It's healthy, high-quality blood flow that enables the healing process, so adequate blood flow is required if you want to heal your Plantar Fasciitis properly and quickly. People love the way BFST® treatments feel. They are very pleasant and relaxing. During treatment, you will notice a slight warming sensation in the bottom of your foot. Some people also experience a slight tingling sensation resulting from the increase in blood flow. We recommend 3-4 BFST® treatments per day, spread throughout the day. The effects of each 20 minute treatment last for up to 4 hours, so even when your treatment is over, your blood flow is still working to help you heal. Almost as important as blood flow is the reminder of your injury. Without the reminder of your injury, you risk feeling a false sense of ability and making your injury even worse than it already is. Avoiding re-injury is fundamental to rapid recovery, which is why we recommend that you continue wearing your wrap between treatments. Simply unplug the controller from the device and remove the Energy Web® from inside the pocket. BFST® Wraps are designed to be worn even when not plugged in, to help protect and support the injured area. This prevents re-injury and contributes towards a faster healing time. Have you ever noticed that professional athletes seem to recover from their injuries much faster than the general public? This is because they have professional athletic therapists who order them to follow a very specific treatment regimen. They are also instructed to rest the foot completely. They cut out physical activity and avoid putting any weight on the injured foot by using crutches. The pro therapists ensure that the athlete supplements the healing process by stimulating blood flow many times each day. Regular BFST® treatments are a standard part of this therapy, because the more we promote blood flow, the faster we will heal. That's why professional athletes are back in the game in a matter of days or weeks while regular patients with the same injuries take months or even years to heal. Add BFST® to your treatment regimen to heal as quickly as a pro athlete. Painkillers mask the pain and cause you to continue to stress and injure your Plantar. They don't do anything to address the underlying condition causing the pain. It is understandable that people need relief from the pain, so if you have to take painkillers, try to restrict them to times when you are off your feet. For example, you can use painkillers to help you sleep. Using them when you are active is a recipe for permanent damage. Plantar Fasciitis can be extremely painful and debilitating. NSAIDs and analgesics such as ASA, acetaminophen or ibuprofen are often used to treat the pain, but these drugs do nothing to treat the actual condition. In fact, NSAIDs and analgesics are known blood thinners and make the bleeding worse for fresh tissue injuries. Typical pain medications actually interfere with the healing process. Cortisone injections are used in extreme cases, but these too are intended to address the pain. They do not promote healing of the injury and they put you at a very high risk of further injury. Avoid the dangers of painkillers. 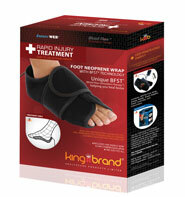 Use a ColdCure® Foot Wrap from King Brand®. This innovative device is incredibly soothing and protects your foot from further injury. Since the wrap and the gel packs are specially designed for the bottom of the foot, they do a superior job of relieving the swelling and pain associated with Plantar Fasciitis. ColdCure® Wraps also work faster than painkillers. While pills take 20 minutes to start working, you will feel the cooling and soothing effect of ColdCure® within seconds of slipping the wrap on your foot. The ColdCure® Foot Wrap provides superior relief of the swelling and pain that comes with Plantar Fasciitis. ColdCure® Foot devices use cold and compression together, because cold and compression are the two things you need to eliminate pain and swelling as quickly and effectively as possible. The application of cold compression must be uniform and complete if it's going to work the best, and this is exactly what ColdCure® Foot Wraps provide. We developed ColdCure® technology as a safe alternative to standard ice packs. Most people aren't aware of the serious dangers that ice packs pose. Ice packs can freeze your skin and cause 'cold burns', resulting in permanent damage to your underlying tissue. Not all freezers are the same. When you take your King Brand ice pack from the freezer, if it is safe to use it will be flexible enough to put in the wrap. If it is too cold and can damage your skin it will be stiff. This is by design. Within a few minutes a stiff ice pack will become flexible and safe to use. Don't worry, it will still be very cold - just safe and cold and the cold will last a long, long time. Better yet, our XC gel is hyper conductive so the cold in the pack moves to where you need it. Don't get hot and cold spots. The cold moves to your injury from all over the pack for maximum treatment effect. 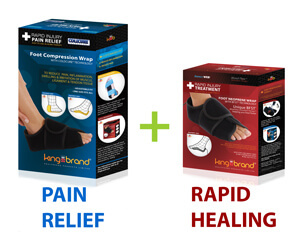 The ColdCure® Foot Wrap comes with 3 swappable gel packs that contain our amazing XC RigiGel® formula. While other gel formulas are watery and mushy, ours is firm yet flexible. XC® gel doesn't move around inside the pack. It stays in place where you need it, even under heavy pressure for long periods of time. One gel pack is inserted inside the wrap at a time, so you can have the other two charging in the fridge or the freezer to keep your therapy going. If you're charging the gel packs in the fridge, there's no need to take breaks between treatments. You can keep using the wrap as long as you need the pain relief. When you're not doing BFST® or ColdCure® treatments, your Plantar becomes vulnerable to further damage. Using KB Support Tape takes some of the tension off your Plantar while you are standing and walking, so you don't have to worry about re-injuring your Plantar as you go about your day. It adds an extra layer of protection and support to your foot, which is important when you're not at rest or doing BFST® and ColdCure® treatments. Our skin is soft and elastic and can stretch much more than the tissue underneath. When you apply KB Support Tape to the bottom of your foot, your skin becomes a much more rigid surface than before, serving to limit how much the skin can stretch. The Tape makes your skin almost into a second Plantar, helping to prevent re-injury. That's why we call it armor for your injury. KB Support Tape provides your Plantar with a protective layer to help balance your weight and prevent further damage. This will contribute towards faster and more complete healing. KB Support Tape comes in 2 styles: Pre-Cut Strips and a Continuous Roll. These 2 styles come in 4 different colors: Pink, Blue, Black & Beige. There's no functional difference between the colors, they just let you express your personal style. The Continuous Rolls of KB Support Tape are perfect if you are looking for a more customizable tape. You can cut the tape into a variety of different lengths and sizes to achieve a completely unique application for your plantar. Each box contains 1 Continuous Roll of KB Support Tape that is 2 inches wide and 16 feet long. While we found the above application to be effective for Plantar Fasciitis, it is only an example. We encourage you to try different applications for Plantar Fasciitis to find the one that works best for you. Listen to what your body is telling you. Use the pain as a guide when you are taping. If you feel pain in a specific part of your foot, apply the tape there. When applying the Tape to your Plantar, you want it to be fairly stretched in the middle. No stretch should be applied at the ends of the tape, but if you want the Tape to act as a secondary Plantar, you will want to apply a good amount of stretch in the middle. What sets KB Support Tape apart from the other tapes out there? For one, it's not athletic tape, it's medical tape. This means our Tape is manufactured to ISO 10993 standards, which ensures that our Tape is made from extremely safe, biocompatible materials. Our Tape is actually made from materials that are safer than most baby products, including toys, clothes and even diapers. Don't let the big brand tapes fool you! Most of them are made from toxic materials, because there are no standards for athletic tape. Some big brand tape glues even contain carcinogenic ingredients. At King Brand®, your health and safety is of utmost importance, which is why KB Support Tape is manufactured to such high standards. Combination Therapy means using the right product at the right time. This is much more effective than just using one product at all times because each product addresses a specific issue. You have ColdCure® to relieve your pain and swelling, BFST® to promote blood flow and accelerate healing, and KB Support Tape for protection and re-injury prevention, resulting in the absolute best treatment for your Plantar Fasciitis. Use the BFST® Wrap during the times when your Plantar is feeling its best. The exception to this is first thing in the morning. The pain you feel with the first steps in the morning is actually your Plantar being re-injured after it tried to heal during the night. To lessen the pain and damage, do a BFST® treatment before you get out of bed in the morning. Doing a treatment before bed is also key because it will help speed up the healing your Plantar does naturally when your foot is resting at night. Start your BFST® treatments on Level 1. For optimal results, we recommend that you do 3-4 treatments daily, spread throughout the day. Since each 20 minute treatment optimizes your blood flow for an average of 4 hours, it's best to do a treatment every 4 hours, or before any type of physical activity. This can include anything that puts a strain on your Plantar (walking, standing for extended periods, etc). This can also be used for preventative measures after a full recovery to optimize your blood flow. See how your body responds after your first 20 minute treatment. If you experience an increase in pain and/or swelling during or after the 20 minute treatment, cut your sessions down to 10 or 5 minutes at a time. Use the ColdCure® Wrap any time your Plantar has been freshly aggravated. This could be immediately upon injury or whenever you are experiencing a flare-up of pain and/or swelling. ColdCure® does an amazing job of relieving pain -- some of our customers have described ColdCure® as "sucking the pain" right out of their body. ColdCure® treatments will also help reduce any visible swelling you may see on the surface, as well as the inflammation you may have and cannot see, deep down in the soft tissue. KB Support Tape can be worn any time -- even during your BFST®* and ColdCure® treatments, but it is most important during physical activity. 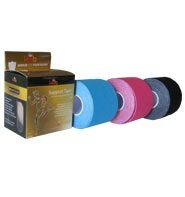 KB Support Tape functions similarly to your Plantar when it is applied to the bottom of your foot. It's like adding an extra layer of protection and security to your injured Plantar. It also helps to balance your weight, lessening the strain on your Plantar. BFST® Wraps are Class II FDA Registered medical devices. This means they meet very high standards of quality, safety and performance. These devices were manufactured and tested to comply with the regulations that the FDA and Health Canada have established. Consumer grade products that you can buy at the store can't say the same. Consumer goods aren't held to the same high standards as medical grade devices like the BFST® Wrap. The FDA and Health Canada hold medical device manufacturers accountable, unlike consumer goods manufacturers whose products are lower quality. The Blood Flow Stimulation Therapy (BFST®) Wrap is designed to promote blood flow in injured tissue below the dermal (fat and skin) layer. Utilizing our proprietary Energy Web®, specially controlled and incredibly safe EMR energy envelops the affected body part and stimulates blood flow in the soft tissue deep beneath the skin. The resulting blood flow brings oxygen and nutrient-rich blood to the injured area, accelerating the healing process. BFST® Wraps come with a 3 level power controller. We recommend that everyone starts at Level 1 and works their way through the levels gradually as their Plantar Fasciitis heals. Proceeding immediately to Level 2 or 3 will not speed up your healing time. You need to condition the body first. When you first start your treatments on Level 1, you may feel a slight warming sensation in the treatment area. This is because, at first, your circulation is poor. The more treatments you do, the better your circulation will become and the less warmth you will feel. This is good. As the warmth lessens from treatment to treatment, this is an indication that your circulation is improving. Better circulation means blood flow all the time, not just during treatments. This is the goal. When you feel almost no warmth during a treatment, it is time to move up to the next power level. Don't rush it though, more heat doesn't mean better treatment. In fact, less heat means better treatment, so take your time moving up in levels. BFST® Wraps are the heating pads of the future. Heating pads bring blood to the surface of your skin and make it hot to the touch. BFST® Wraps stimulate blood flow deep beneath your skin to repair your damaged tissue. Bringing blood to the surface of your skin does nothing to heal the injury deep below. BFST® Wraps work to actively heal your soft tissue injury through the promotion of blood flow. Heating pads can't do this. 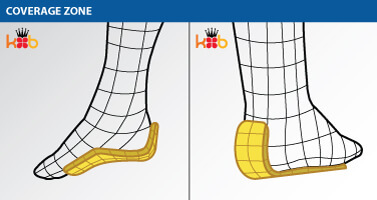 The Energy Web® of the BFST® Foot device comes inserted inside a soft, comfortable neoprene wrap. The wrap molds the Energy Web® to the bottom of your foot and up the back of your heel to target the entire Plantar Fascia region. This ensures that you receive an even distribution of energy over the entire injured area. The wrap comes with a removable Velcro® belt that you can apply around your foot to adjust the fit. The BFST® Wrap does not need to be removed following a treatment. Simply unplug the device and remove the electrical components. This will act as a reminder of your injury and help prevent further damage to your Plantar. Don't stop doing BFST® treatments. Even once your pain is gone, your Plantar may only be 20% or 30% healed. You need to continue using the BFST® Wrap for several months after the pain is gone. This will ensure that you maintain the healing you've done and will help you heal further. Once you get back to your regular routine, do a BFST® treatment before you're physically active. This will help prevent re-injury during the activity and will act as a warm up for your circulatory system. ColdCure® Wraps are Class I FDA Registered medical devices. They exceed all government and health agency regulatory requirements for cold therapy, specifically for use in treating soft tissue injuries. When applied to your foot, the ColdCure® Wrap immediately reduces the risk of further damage from excessive swelling. Doctors and Therapists agree that controlling swelling is a fundamental part of reducing long term permanent damage resulting from soft tissue injuries. ColdCure® RigiGel® packs are much safer and more effective than ice and products that contain mushy blue gel. Why? Because RigiGel® packs are like ice, but they stay at 32°F / 0°C. While they may start out at about -4°F / -20°C straight from the freezer, after a few minutes they will go to 32°F / 0°C and stay at 32°F / 0°C for a long time. This is the ideal temperature for cold therapy, because it's cold enough to relieve your pain and swelling, but safe enough to not cause cold burns. Ice and blue gel packs will also start out at -4°F / -20°C and rapidly go to 32°F / 0°C, they keep warming up very quickly, instead of staying in the safe, effective zone of 32°F / 0°C. The XC Gel® danger zone is very small but the benefits are huge. While XC Gel® packs are designed to be stored in the freezer, you can store them in the fridge if you find them too cold from the freezer. If you find that the gel is too stiff from the freezer, leave it out for several minutes before inserting it inside the wrap. Once the pack is soft enough to bend, it is ready to use for treatment. RICE - Rest, Ice, Compression & Elevation - is the formula many people follow when dealing with a soft tissue injury like Plantar Fasciitis. However, most of these people probably aren't aware of how dangerous ice can be. Ice can actually freeze your skin and numb your nerves, causing 'cold burns' and even permanent damage to your underlying tissue. The proper solution is RCCE® - Rest, Cold, Compression & Elevation. You don't want to apply ice, you want to apply cold that is just above freezing. Yes, you want cold - and lots of it - but not so cold that it is below the freezing point of water. ColdCure® gel packs contain 3x more gel per lb than other products, for complete coverage of your plantar. When stored in the freezer, XC Gel® packs also have 10x more cooling power than other products, meaning longer treatment times without having to swap the gel packs as often. This also means faster relief from pain and swelling. Bigger packs with more gel inside plus superior cooling power means an overall better, more effective treatment. The ColdCure® Foot gel pack is custom designed to mold to the shape of the bottom of your foot and the back of your heel. It covers your entire Plantar Fascia to ensure that your injury receives an even distribution of cooling power. All of our gel packs are designed for the specific body part you're treating. We don't just have 1 generic gel pack shape because it wouldn't be able to target all the different areas of the body. Each part of the body is uniquely shaped, and that's why all of our gel packs are uniquely shaped too. This product has 100% been designed to treat Plantar Fasciitis. Regular gel packs have hot and cold spots, making treatments uneven and inconsistent. Our unique XC RigiGel® formula distributes the cold energy evenly throughout the entire pack. This means the gel pack will always have a perfectly balanced cold temperature. When cold pressure is applied to a foot with Plantar Fasciitis, the gel starts to warm up in that specific spot faster than the rest of the pack. The cold energy in our gel packs is transferred from the cold spots to the warm spots much more effectively. This is a huge improvement, as your Plantar will receive the cooling power of the entire gel pack. XC® gel packs have 2 different colored sides: a white side and a gold side. Both sides have all the same amazing benefits that XC RigiGel® gel has to offer. XC® gel packs can be inserted inside the wrap with the white side facing towards your foot or away from your foot since they are not side specific. Note from KB WebMaster - The text below is primarily intended to assist with Google properly classifying this page content. To learn more about our products please visit our website.<br>Plantar fasciitis plagues many people. A bad plantar injury causes plantar pain. There are many symptoms of plantar fasciitis pain caused by plantar injuries. Treatment for plantar fasciitis will cause your plantar pain to improve and your plantar fasciitis to heal. There's no doubt that to heal plantar fasciitis quickly you need BFST treatments. Coldcure will help with plantar pain. You can relieve plantar pain and a plantar injury with BFST and coldcure technology. So, if you want to heal your plantar fasciitis quickly, you need BFST. If you want to treat plantar fasciitis pain you need coldcure. plantar fasciitis symptoms are plantar pain and swelling. A sore plantar can be helped with plantar fasciitis exercises although plantar exercises won't cure all plantar injuries. Some plantar injuries require plantar fasciitis surgery. This may heal the injured plantar but the pain in your plantar after surgery can be severe. The best plantar fasciitis treatment is BFST. The best plantar fasciitis pain treatment is coldcure. These wraps are incredible. They feel comfortable. They work.